If you’ve a blog or website and want to appear your pages in the search engines result pages SERP’s, then you must submit URL to Google anf other famous search engines like Yahoo, Bing etc. Google is the king of search engines so always you can focus on it. In previous article, we show you how to submit blog or site URL to Bing Webmaster Tools . Here we’ll guide you to how to submit your site to google and and index it quickly using the Fetch as Google Tools. If you already submit your blog URL, but Google not index it completely, or you can published posts frequently and fastly, but Google doesn’t index them as fast, so don’t worry, here is the method of how you can easily index your blog or website URL’s quickly and easily. Google Webmaster Tools is the powerful and famous tools of Google, which allow web owners and web masters to manage their websites data , see their results, and much more to their Google Webmaster Tools account. Hopely you may already used these tools. but did not know how to submit and index your blog or website url to Google easily and fastly. 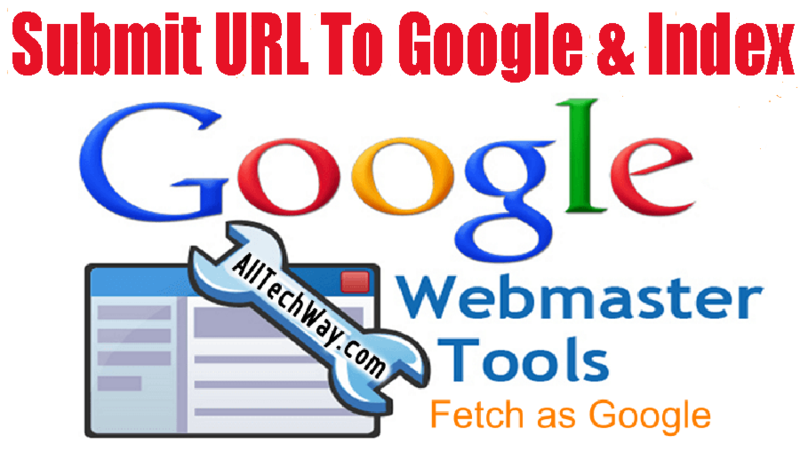 Step 1 – First of all go to Submit URL To Google Webmaster Tools . Step 2 – Enter your site or blog URL in the given field as shown in screenshot. Step 3 – Enter reCaptcha correctly . 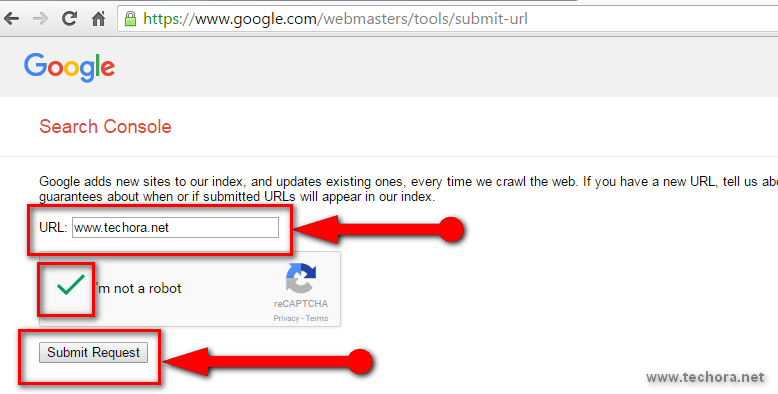 Step 4 – Click on “Submit Request” button and now Google will automatically index your site. Step 1- First of all go to the Google Webmaster Tools. Step 2 – Log in your account via your Gmail ID / Account. Step 3 – Click on the upper right side, a red colored button “ADD A PROPERTY” and enter your website URL . Now you’ve done your work, you’ve successfully added your blog or website URL to Google Search Engine for indexing. After this can again log in here and enter your blog or website sitemap which is compulsory for fast indexing of your new posts and pages. So in this way you can easily submit your site URL to Google Search Engine. But after that, if you realize that your posts are not frequently indexed by Google, then you can easily sign in here and adding all pages manually and indexed them for better SERP’s results. For this purpose follow the below guide which help you to indexed your posts fastly. Step 1 – First of go to the Google Webmaster Tools. Step 2 – Similarly sign in to your account using your Gmail ID. Step 3 – Now here your dashboard, select your submitted blog and go to their dashboard. Step 4 – Now on the left sidebar, go to the “CRAWL” option and from them go to the “Fetch as Google” option . Step 5 – Now here simply “Enter Your Site URL” in the box, and click on the “FETCH” button . Step 6 – After click on the “Fetch” button, a button “Submit To Index” button appear , simply click on it and a box will open . Step 7 – Here in this pop up box, simply entering the Captch correctly and select the second option “Crawl this URL and its direct links” and click on “GO” button. Step 8 – So you’ve done all the work, for checking simply go to Google.Com and check your URL here , so this is directly indexed and display in the SERP’s . 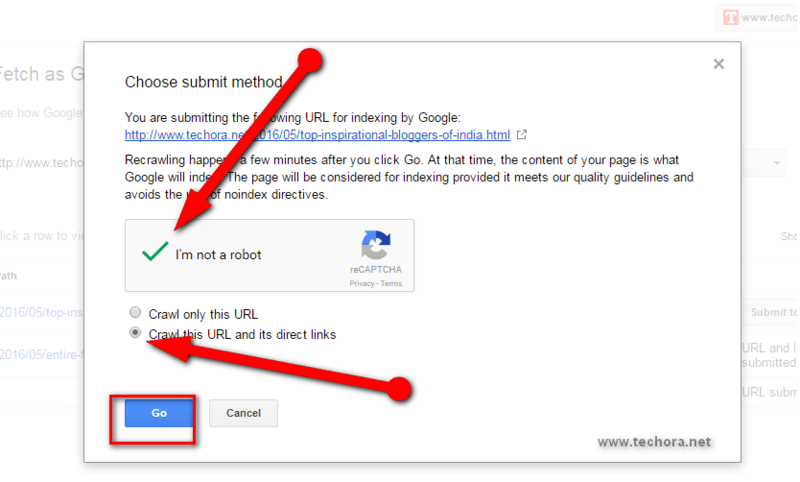 So this is the complete guide of submit url to Google and index quickly , which is very helpful to you and all others. If you like this guide, then please share with others, so everyone get benefit from it. For more updates simply sign up our newsletters . If you share your own experience with us, then use the comments box below. Thanks !! !